LE MANS, France (June 19, 2016) -- The No. 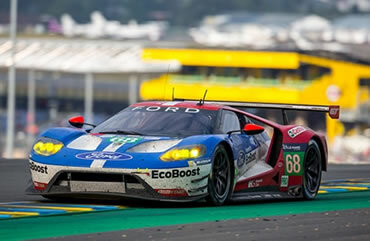 68 Ford GT of Sébastien Bourdais (FRA), Joey Hand (US) and Dirk Müller (GER) crossed the finish line at Le Mans at three o’clock on Sunday, as the overall GT winner of the 2016 Le Mans 24 Hours. The No. 69 Ford GT of Ryan Briscoe (AUS), Scott Dixon (NZ) and Richard Westbrook (GB) joined the winners on the podium after scoring third place. The Nos. 66 and 67 Ford GTs finished in fourth and ninth places, respectively. First unveiled to the media at Le Mans last year, the Ford GT’s Le Mans victory comes 395 days after the car turned a wheel for the first time on May 20, 2015, at Calabogie Motorsports Park in Canada. 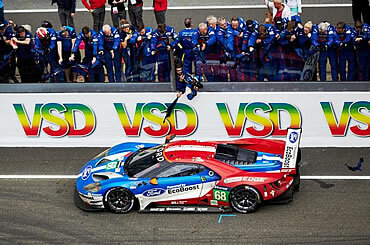 A Herculean effort from the Ford Chip Ganassi team has transformed the car into a Le Mans winner in just over one year. After a titanic battle with the No. 82 Ferrari, the No. 68 Ford GT took the lead for the final time in the 20th hour of the race. Hand was behind the wheel on the three occasions that the Ford passed the Ferrari, rekindling a 50-year-old rivalry between the two car manufacturers. This victory is particularly sweet for Bourdais who was born within sight of Tertre Rouge. 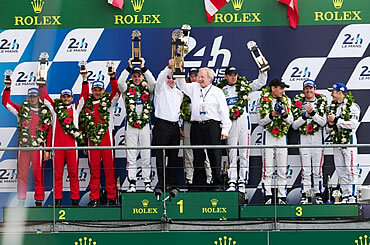 The Frenchman had competed at Le Mans 10 times previously but this is his first win. The No. 66 Ford GT, raced by Billy Johnson (US), Stefan Mücke (GER) and Olivier Pla (FRA) was in contention for a top result during the race’s infancy but a small electrical problem put paid to their attack. Such is the pace of the Le Mans 24 Hours, one extra moment in the pits is all it takes to be out of the running. The No. 67 Ford GT of Marino Franchitti (GB), Andy Priaulx (GB) and Harry Tincknell (GB) suffered from a gearbox issue at the start of the race so they had to play catch up for the full 24 hours, coming home in ninth place. With his 175th victory as a team owner, Chip Ganassi becomes the only owner in history to win the Indianapolis 500, Daytona 500, Brickyard 400, Rolex 24 At Daytona, 12 Hours of Sebring and Le Mans 24 Hours. The No. 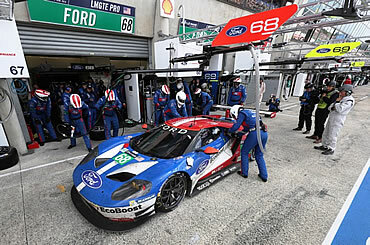 66 Ford GT earns maximum FIA World Endurance Championship points from this event, which fires up the competition for the remainder of the WEC season. The IMSA Ford Chip Ganassi Racing team is flying high all the way back to the US for the next round of the WeatherTech SportsCar Championship at Watkins Glen on July 3.